Adds the spell \"Fade other\" as a tome you can pick up to the game. The spell is an expert Illusion spell which turns the target invisible for 30 seconds. 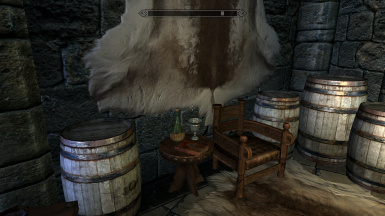 Can be picked up in your room at the college of Winterhold, in the hall of attainment. 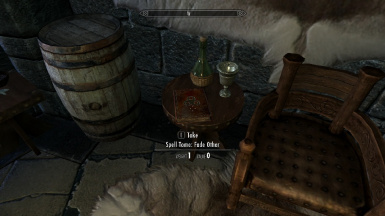 A quick, small mod that adds the spell "Fade other" as a tome you can pick up to the game. 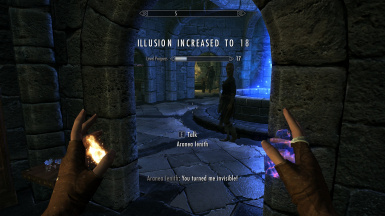 The spell is an expert Illusion spell which turns the target invisible for 30 seconds. Can be picked up in your room at the college of Winterhold, in the hall of attainment. I was inspired to make this after a kid in Solitude asked me if I could turn him invisible after seeing me cast magic. This spell has always been "in game" but never actually available to learn as far as I know. Interesting thing, some NPCs and Followers will react to you casting this on them. Try it out on Lydia! As I didn't actually "make" anything in this mod, all credit goes to Bethesda. All I did was edit spells that were already there. Extract to your Skyrim Data folder and turn FadeOtherSpellTome.esp on through NMM or the launcher. To uninstall just delete FadeOtherSpellTome.esp from your Data folder. Shouldn't conflict with any other mod unless it places an item exactly where I put this one. Untested, but when you uninstall the mod you may still retain the learned spell. Since the spell was already in game and this mod doesn't actually "add" the spell to it, just adds the tome to learn the spell. Please let me know if this mod does anything, glitches, bugs, etc. I'll try my best to fix it.